A dangerous forward pocket/rover, Roy Ringrose was one of the most effective goalkickers in northern Tasmanian football during the 1950’s. After his playing career ended, he became a popular administrator for more than 30 years across the state. Born in Victoria in 1926, Roy Ringrose began his football career with VFL club Essendon, however he was unable to break into the Bombers’ powerful senior team of the time, and in 1948 crossed to VFA side Brunswick. The move paid instant dividends, with Ringrose booting 54 goals in two seasons with the Magpies, including a haul of 7 against Preston in 1949. In 1950, he was recruited by NTFA powerhouse North Launceston, and in his first season with the Robins he was a member of the club’s NTFA and State premiership teams under Gavin Luttrell, Ringrose himself booting four goals in the NTFA decider. The following season Ringrose was appointed captain-coach of the Robins’ reserves team, although he did still make occasional appearances with the senior side, including booting five goals in the 1952 preliminary final loss to Scottsdale. This triumph would be Ringrose’s last match for the club, as soon afterwards he was offered the position of assistant coach with Longford for the 1953 season. Ringrose accepted, however North Launceston refused to clear him, and an official appeal was necessary before Ringrose was allowed to join the Tigers. 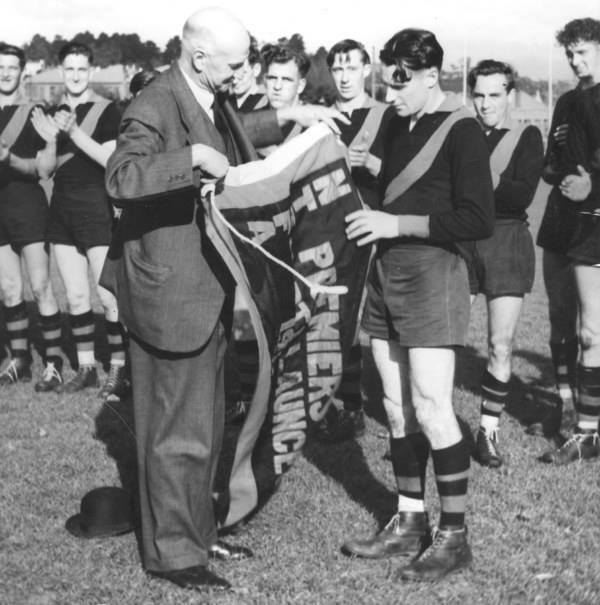 Ringrose’s two seasons with Longford were highly successful: he booted 60 and 54 goals respectively to top the club and NTFA goalkicking tables in 1953-54, this influence helping the Tigers to Grand Final and then Preliminary Final finishes; this small success was a timely foreshadowing of the club’s soon to be halcyon years of the mid-1950s. However, by the time the premierships of 1955, 1957 and 1958 rolled around Ringrose had once again swapped jumpers, now lining up for perennial NTFA underdogs Cornwall. The Demons hadn’t enjoyed a great deal of success during their first decade in the NTFA, however Ringrose gave the club something they hitherto had not possessed: a genuine superstar. Despite now being more than 30 years old, Ringrose had lost none of his potency, topping the NTFA goal table again in both 1957 and 1958. By the time he finally retired at the end of 1959, Ringrose had played 10 seasons in the NTFA for a return of more than 350 goals. Post-retirement, Ringrose coached East Launceston for one season in 1961 before stepping away from the game for a time. He re-emerged nearly 10 years later during the mid-1970s as the president of the NWFU, a role he held for nearly a decade. During this period, he was instrumental in the formation of the short-lived Greater Northern Football League, a competition whose greatest achievement was a stunning 10-point representative win over the VFA in Devonport in 1981. Ringrose later went on to hold roles as a TFL Director and State Selector for eight seasons as well as President of the Burnie Hawks during that club’s early years in the TFL Statewide League. During this time Ringrose’s contribution to the game was repeatedly acknowledged, receiving Life Membership of the TFL and NWFU, as well as a Merit Award for ‘Services to Football’ from the Australian National Football Council. Roy Ringrose passed away in 2006 at the age of 79.